The box is designed with small size and lightweight in mind for the purpose of traveling light. 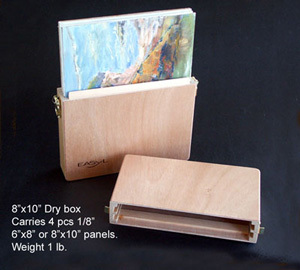 Carries eight 1/8" or four 1/4" panels sizes 9" x 12". With leather handle for easy to carry. The picture on left shows the DB-1012 Dry Box is carrying 8 panels. 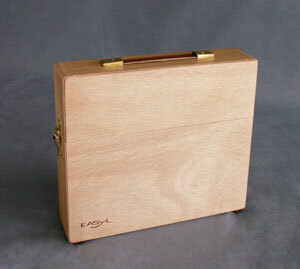 Carries 4 pieces of 1/8" panels sizes 6" x 8" or 8" x 10". 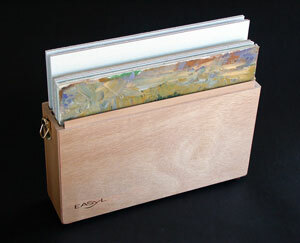 DB-0912 Carries 8 pieces of 9"x12" panels. DB-0810 Carries 4 pieces of 8"x10" panels.